Drop ins are on the first Tuesday each month (except August and New Years Day). They are from 10 – 12 in the Central United Reformed Church (CURC) at the lower end of Chapel Walk. For dates please see the SU3A Calendar. Everyone is welcome to drop in at any time between 10.00 am and 12.00 noon. Free refreshments will be available. There is no formal programme – this is an opportunity to meet up with friends, make new friends from different groups, exchange ideas, ask questions and promote forthcoming events. You can also advertise your group or test interest in a new group. There will be several committee members present each month. Help is usually available for those with ipads or tablets who have IT or web problems. Help is also available with online membership renewal. SU3A members take part in many research projects designed to improve understanding of physical and mental issues in older people. These are sometimes advertised at the drop in, and you can talk to the organisers about what is involved. Over 40% of people over 50 experience hearing loss rising to 71% for those over 70 (AOHL). Deafness is a catch-all term but everyone’s hearing perception is different. Some people lip read without realizing they are doing so. People don’t like to admit to going deaf. It typically takes many years for someone who, owing to hearing loss, is experiencing communication problems to seek help. Even after that, there is sometimes a considerable wait before they actually get a hearing aid. Hearing aids are not always easy to get to grips with and can need some perseverance; the frustration and isolation that can come with deafness is obviously not good for your wellbeing. 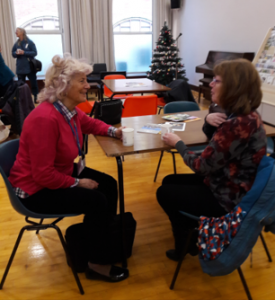 If you are interested in talking to someone who admits to being deaf themselves and is striving to come to terms with it whilst keeping as engaged as possible with the rest of society, then we have a quiet area that has been set aside of a chat. We aim to have someone available between 10:30 and 11:30 am at the monthly U3A Tuesday drop-in. You will be directed to the area after having registered. We do not offer advice and do not aim to be a substitute for your seeking medical and audiology help. However, we can offer a sympathetic ear and inform you of our own experience and of what support and strategies we have found useful ourselves.